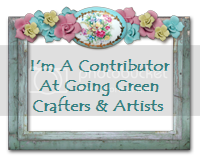 As blogs go, this particular crafting blog is usually pretty fluffy. This is usually my respite from the reality and harshness of the world. But, at the end of the day, some things are too important, even if they are tough. The wonderful Cathy posted this on her blog, and I was moved to do so as well. I’d be willing to bet that 99% of the people who read this blog have known someone who has survived cancer or hasn’t. If you are lucky enough to be in the 1%, please understand that cancer is indeed an epidemic. Don’t let the survivors fight alone. They fight so hard for the ones who can’t, or the ones who lost the battle. Pick a charity (mine is St. Jude’s) and donate what you can. Please. I post this in honor of: my mother (survivor), my father (survivor), both my grandfathers, my grandmother, two aunts (one survivor), my dear friend who would be 31 this November, a friend in junior high (survivor), two of my professors (both survivors), and many more. And that’s in 31 years of life. Greetings! It is time for Sunday Scrappin: the weekly blog meme for paper crafters. We post our “Ta-Das” for the week, our “To-Dos” for the coming week, and participate in weekly challenges (optional). Check it out. I prepared some Christmas wrapping paper scraps for use on cards and tags (no pic, sorry–you’ve all seen cut-up wrapping paper before I’m sure, LOL). I look forward to seeing what everyone else has planned and has accomplished! Just for fun, I’m including this photo I took a week ago. If anyone can correctly identify the place, the first person to post the correct answer will win something from me (I know, that’s a huge opportunity–SOMETHING! Ooh wow). 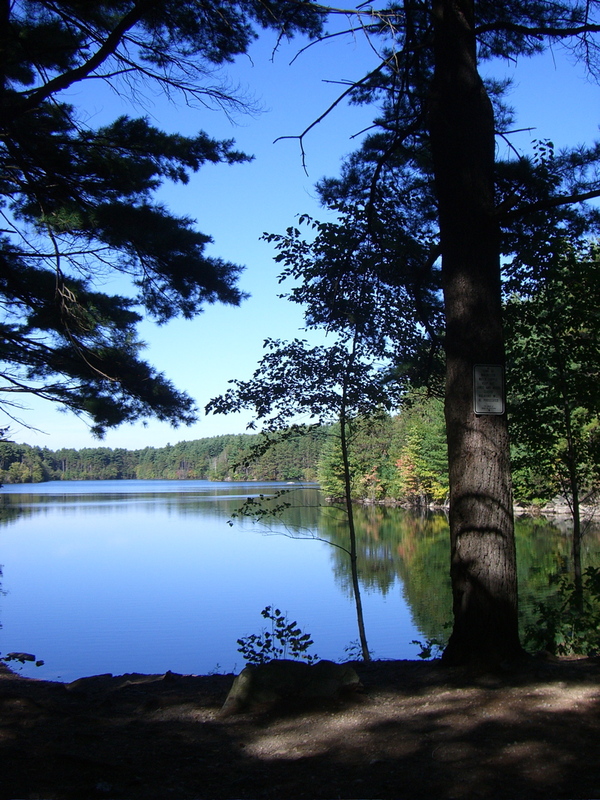 I’ll give you a clue…it is someplace in Massachusetts! REMINDER: When I get to 2000 hits (not too far away), I’ll be holding a drawing. Those of you who have left 10-25 comments on my blog since I started this mess will be eligible. Chrissy is just one comment away from eligibility! Sandy needs only four more comments. Wani and Bailey’s Granny need only five more comments. 1.Getting all the major contracting work done on the new house and closing on said house, are some of the things I’m most looking forward to in October. 2. Sometimes I feel like a childless mother, thanks to my cat. 3. My husband said he would probably never have a cat, and now we do, and that’s why there is a saying, “never say never”! 4. When I’m down, the weather seems to notice. 5. Connected to the laptop or sitting on some form of public transit are where you’ll find me most often. 6. A rainy day is good for doing work (research). 7. And as for the weekend, tonight I’m looking forward to having dinner with my husband, tomorrow my plans include spending all day at a conference, and Sunday, I want to get caught up with myself. I was talking to my mother this weekend and I said, “My list of HAVE to-dos is the longest, next comes the SHOULD to-dos, and then finally the WANT to-dos.” If I do them in order, I’ll get to the WANT to-dos on my deathbed. The real problem is that it has been my priority system from day one. But I’m at a place in my life where that priority system, should I accomplish it, may make me productive, but not terribly happy. Unfortunately, the colors are not perfect in the photo, so you’ll just have to take my word for it that it looks really nice in reality. It is a lavender and green color scheme. 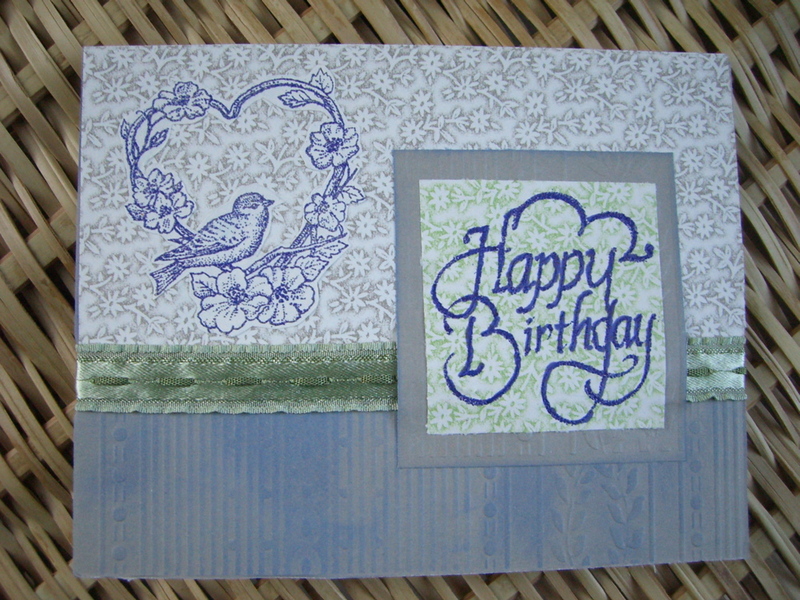 MATERIALS & TECHNIQUES: Paper is ALL from Martha Stewart (a pack of coordinating craft paper in green and taupe). 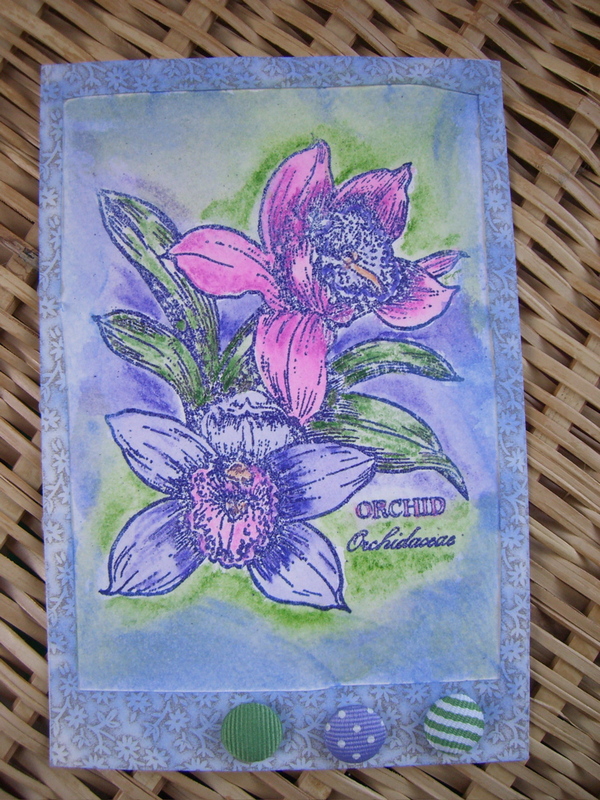 I sponged lavender pigment ink (ColorBox) on the textured taupe paper (bottom of card) in order to bring out the pattern. The ribbon is from my stash, but I love it because it has that stitched look in the middle. The stamp is one of my favorites, an oldie-but-a-goodie from All Night Media (“Tweetheart” 403F) that I cut out with a craft knife. I embossed it with JudiKins “Candy Violet” EP. The “Happy Birthday” (Stampendous, D07)) was embossed as well, but the poor stamp is so old it doesn’t really stamp very well, so I ended up going over it with a purple sharpie. Although the Happy Birthday tag looks a little lumpy in the photo, I actually like the fact you can see the ribbon underneath it because the whole card actually looks more like fabric in real life. Well, the post doesn’t seem to be up over at Sunday Scrappin‘ yet, but I’m gonna go ahead and post here. Another super-light crafting week! My one ta-da was this entry for Sunday Postcard Art. This coming week is likely to be as busy as the last, AND I start a new class (not craft-related–I WISH) on Thursday nights. Hauling out to teach in a different state twice a week is taking its toll, but at least I can get work done on the train. Coming back from teaching and then going to sit in a class will be a major challenge for the next 10 weeks. Wish me luck. I hope I can get at least ONE crafty thing done this week. 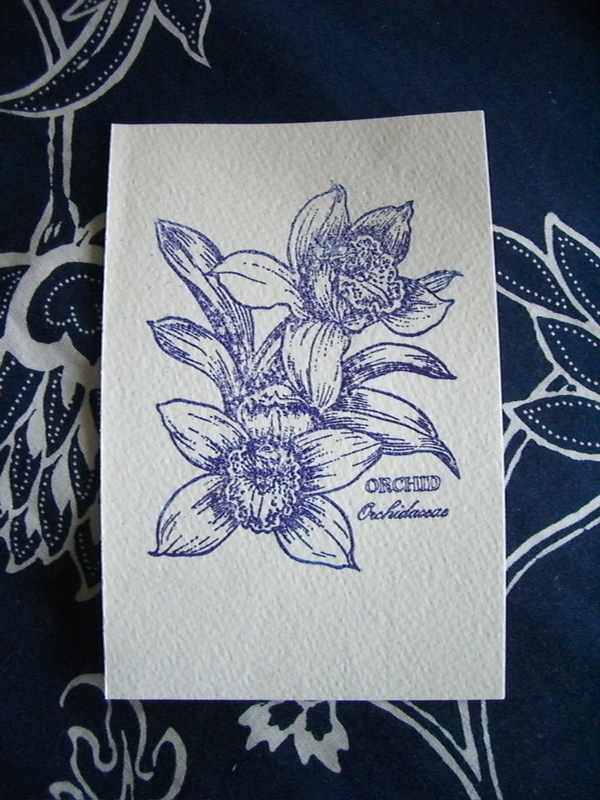 This last week’s theme over at Sunday Postcard Art was flowers. As usual, I’m a Jenny-Come-Lately (I think most people do theirs the week before…), but since it is probably the only crafting I’ll do this week, there you have it. MATERIALS & TECHNIQUES: Stamped image (place unknown), embossed with Candy Violet EP. Border: Martha Stewart paper, colored image with Stabilo aquarelle water-soluble colored pencils, sponged lavender pigment ink over entire card, brads are from Making Memories. If you didn’t read the post previous to this one, and you are a crafter who wants to be part of something more, I suggest you do take a look at it. The fact that I have no time to craft is sort of a good thing because it means I’m being productive in my professional endeavors. But I miss it. 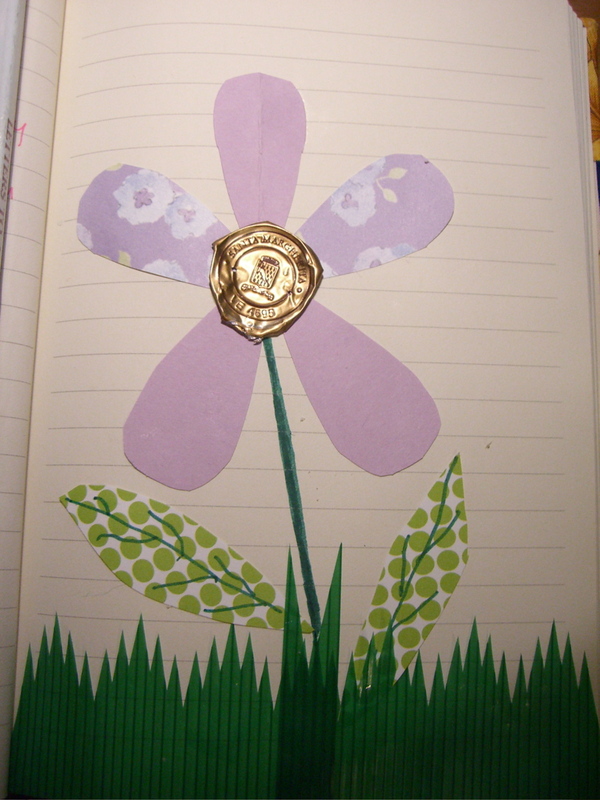 I don’t know what I’ll get done in the coming week, but here’s this week’s inspiration/challenge at Sunday Scrappin’.